Milan Image Art Fair, known as MIA, just ended. I was featured as a Proposed Artist, and showed my Hopper’s American series.The fair has a unique format. There’s about one hundred booths, of which ninety are set up by galleries from around Europe. The kicker is that each booth may only showcase one artist. Those galleries who want to represent more than one artists arrange for multiple connecting booths. The remaining ten booths are granted to artists who are selected from a large number of submissions, and I was chosen early last year, before I had gallery representation. Between my selection and this recent show I found representation by CAMERA WORK, one of the top ten Photo Art galleries in the World. I discussed the opportunity with my gallery here, and ordinarily a represented artist does not host his own booth at a fair, but they felt it would be a good experience for me to go. Though I’ve been to many fairs as a buyer, fan, artist, and general aficionado, it is a different ball of wax entirely to experience that part of the art world first hand. It’s not easy. The hardest part is standing there for eleven hours a day, talking about my own art. Most of the people don’t realize they’re talking to the artist directly, and the comments and questions run the gamut. My work is very good, and I got a lot of compliments. 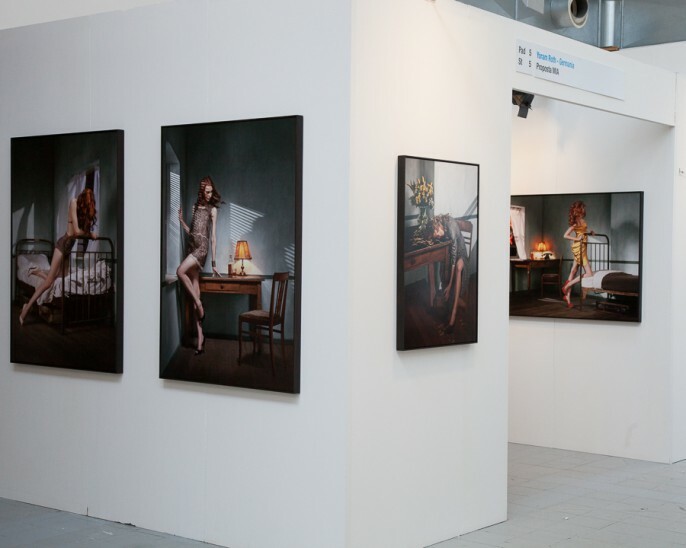 Many of the people who attend photo art fairs really know the genre, and it was great to hear so much validation. The nicest moment of course is being bought by someone who really understands my particular style. To be added to a collection by a collector who has Gregory Crewdson, Cindy Sherman and Sandy Skoglund is a huge compliment. More frustrating are the large huge number of hobby photographers who come to these fairs and want to talk endlessly about camera gear. They will bore you into the ground with questions about lenses, paper, and post-production issues, with virtually no interest in the artwork itself. But I’m professional enough, and can keep smiling and answer all questions. Equally frustrating are the people who want to talk about naked models, without realizing that my work means something to me, that it’s more than just pretty pictures. The Hopper series is important to me, and all my work has happened in some personal way, whether it is obvious or not: The Hoppers documented a major change for me… I had a third son, we had moved from Los Angeles to Berlin, and most of all I was dedicating myself to this form of art. The images I created were about that moment just before or after something happened, with uncertainty over whether it was a good thing, or a bad thing. The images are melancholic and dramatic, because that is how I was feeling at the time. And as always, I use the language of fashion photography on purpose: it breaks down the image filter that modern people have acquired. So when occasional booth visitors dismisses the images as just “pictures of hot chicks” they completely miss the point of my work. Of course there were also critical comments. Some of these had merit, and came from people who really understand photography. They focused on the complexity of the process, and the nature of the image. One I liked was a visitor who confided in me that he’d seen the artist’s newer work, and that it was even better than this older series. Others showed me elements of my work that I had never fully considered before, and that will flow directly into the newest series. A few told me in quite diplomatic but articulate ways why they dislike my style. It’s a matter of taste, and I respect their choices. But some of the criticism was quite off-center and tangential. Fortunately I’m a grown-up, and have honed my thick skin through online communities and other forums. But let’s just say that the hundreds of people who show up to a Photo ART Show with fully packed camera gear bags are not going to be talking about art and feelings. The real reason to go is to connect with new galleries, publications, and collection advisors, and to build a list of people who are genuinely interested in my work. This part of the mission was highly successful. There were many galleries who came by to speak to me, or took me over to their booth to discuss their approach to art. But many of them don’t have the scale that I’m looking for. Simply put, I am very committed to my path as an artist, and I want to work with galleries that are equally serious about their business. But there were three galleries on my list before going to Milan, and all three conversations went very well. I expect a few interesting shows in the next eighteen months. I will say this… I am extremely grateful to a huge team of people that I work with. I know I made a major impact at this show. Call it hyper-confidence, but my work was some of the very best on show. I mean that in terms of creative content, execution, and technical efforts. Everything from my printing and framing, to materials, and of course the images themselves. I am coming home more sure of myself and my art than ever before. Call it pompous, but I like where my work is going, and those who know me will tell you that I spend plenty of time wrestling with my demons and self-confidence.